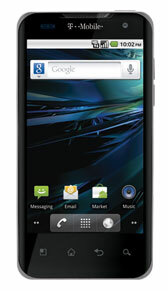 T-Mobile is introducing the LG G2x, its first smartphone running Nvidia's speedy Tegra 2 dual-core mobile processor. The G2x is a 4G phone with a 4-inch touchscreen, running Android 2.2. In addition to the 8-megapixel camera with LED flash, there's a 1.3-megapixel camera for video chat using the preloaded Qik software. The G2x can also capture video at full 1080p resolution. The G2x will ship in the spring; the price hasn't been announced.